Trying the Really Right Stuff BH-40 Ball Head has long been on my to-do list. The attraction to this head, aside from the very impressive design and ever-present quality in Really Right Stuff products, was the modest size and weight. I went into a lot of detail about ball heads in general, including why they are the best general purpose tripod head choice, in the Really Right Stuff BH-55 Ball Head review (I highly recommend reading that page), so I'll keep this review more concise, focusing primarily on the BH-40 specifically here. Know that the quality and performance of a tripod head can vary greatly and in most cases, you will be glad that you selected a quality model. The BH-40 easily qualifies for that definition. As with tripods, ball head selection involves finding a model that offers the right balance between dimensions, weight and cost along with the features and quality it offers relative to needs. Here are the Really Right Stuff BH-40 Ball Head's measurements and specs sandwiched between its closest siblings. This is a very compact ball head model with some serious weight shaving compared to the BH-55, weighing in at 55% as much as the larger head. It measures 80% as high and 73% as wide at the minimum primary diameter and those numbers do not seem as differentiating as they appear in real life (hopefully the comparison image makes that difference clear for you). As you will notice in some of the product pictures in this review, I've used the BH-40 on the Really Right Stuff TQC-14 Carbon Fiber Tripod. While this combination works great, the BH-40's mid-sized base diameter is wider than the TQC-14's top plate. 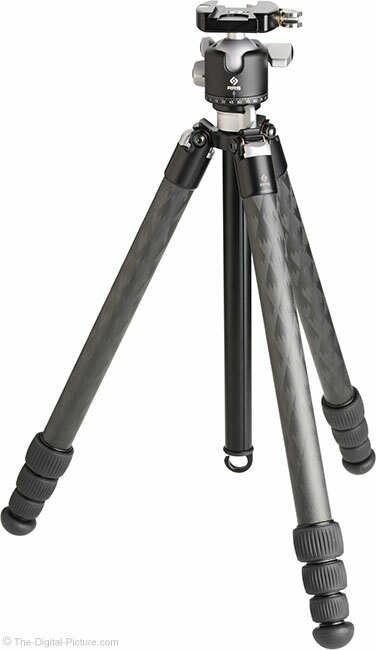 I later purchased the Really Right Stuff TVC-24/24L Series 2 Carbon Fiber Tripod and this match is perfect in terms of top plate diameter, size and capability. 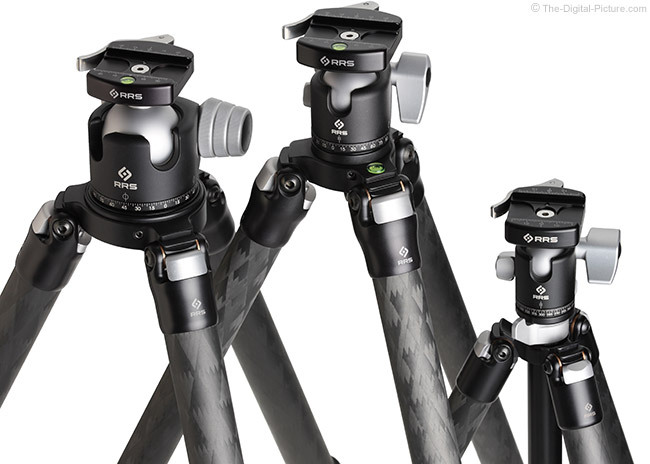 The 2-series tripods from many other manufacturers will also match ideally with this head and those with 3-series models looking to shave some weight will also find this head an ideal choice. After using this head for a while, it seemed to me that the load capacity spec was understated, which appears to be a common attribute among RRS ball heads. I gave the BH-55 what seemed like an extreme test. With the clamp positioned to just-shy of its 90° limit and the ball lock knob tightened firmly, I put my entire body weight on the off-angle clamp. I weigh 170 lb (77 kg) and the clamp didn't move. That's impressive. What is even more impressive? The BH-40 can do the same thing! Exceeding the manufacturer load rating may void the warranty and may cause damage to the head, but in this case, I think the load rating is a very comfortable one. I'll provide more-specific gear capacity advice later in the review, but at this point, hopefully you know if the Really Right Stuff BH-40 Ball Head is appropriately-sized for your application. Simplistic product names with meaning are great and such is "BH-40", representing "Ball Head" with a "40" mm ball. Let's take a closer look at the beautifully-designed Really Right Stuff BH-40 Ball Head. Mouse over (or tap) the numeric labels under the product image to see a variety of views of this head. Most ball heads are similar in overall design and the Really Right Stuff BH-40 Ball Head is normal in this regard. Less common is Really Right Stuff's meticulous attention to detail and uncompromising design decisions. All components, including the knobs (all are captive), are machined from solid aircraft aluminum or stainless steel for a superior strength and a high-precision fit. As with all of Really Right Stuff's products, aesthetics were also not compromised. The Really Right Stuff ball heads are very sharp-looking with a much-desired clean, simple design. The quality black matte finish is very nice and optimal for avoiding reflections (though marks from fingernails, branches, etc. readily show). Silver knobs provide an attractive touch of contrasting color. A significant ball head part is the body (chassis, etc.) which is of course required to hold the ball in place. Like its siblings, the Really Right Stuff BH-40 Ball Head's body is very-strongly and precisely CNC-machined from aircraft aluminum. As usual, the ball lock knob is the biggest knob and you will spend plenty of time with it in your hand. These knobs are generally rounded or in a lever configuration. On compact heads, a lever is typically required for the longer throw radius they provide while avoiding interference with other parts. While round knobs are generally easier to roll with fingers, they cannot be made large enough on a compact head. The extra length is needed to comfortably provide the torque necessary to lock a ball tightly and this head gets the lever. Perhaps the most significant issue with levers and their length is that they can impact the clamp, tripod base or even camera parts. Helping to resolve that issue is the spring-loaded design that easily permits easy lever orientation change. It is still rather easy to impact the ball lock knob, the back of the head and the tension adjustment knob with the clamp when photographing upward, requiring the clamp to be rotated counter-clockwise until the full upward angle can be obtained. The BH-40's ball lock lever (called a T-knob) is very long relative to the size of the head, measuring 1.86" (47.3 mm) in maximum diameter. That part diameter exceeds those of substantially larger heads, including even the BH-55. This knob provides very substantial pressure on the ball with only modest effort. The machined shape is a very comfortable one, including no sharp edges. I talk about some of the ball head aspects that can be discerned using the lock knob and I'll cut right to the chase here. This ball locks very tightly with only modest pressure and, again, it can hold tight with my full weight applied off-angle. A differentiator is how smoothly the ball can be adjusted as it approaches fully locked down. While I'm not going to call this one silky smooth, the slight slip-stick behavior the BH-40 exhibits under pressure is not bad and has not bothered me. Another differentiator is how much the ball moves as it is tightened. It is very frustrating to carefully frame a scene only to watch the framing drift as the ball head is tightened. With tension properly-adjusted (snug), there is slight movement to right when tightening the main lock knob. The amount is barely noticeable at 400mm and basically not noticeable at 100mm. With tension reduced, there is a small amount of movement visible at 100mm. The BH-40's body surrounds the ball with Delrin, a dimensionally-stable engineering thermoplastic ideal for high precision parts that require high stiffness and low friction. The Delrin provides a smooth surface for the ball to move against and protects the ball stem from metal-on-metal impact at the edge of the body. Ball tension control knobs are a common feature on quality mid and larger-sized ball head models. These permit the minimum drag/friction level on the ball to be set. Even though the BH-40 is a rather small head, RRS managed to fit a nice-sized 0.71" (18.0 mm) tension control knob into the design. As with the rest of the knobs on this head, the tension control knob is CNC-machined from aluminum. A tapered, rounded design makes the knob easy to roll in the fingers. As alluded to, I typically find that the ball tension should be comfortably-tight for the least amount of ball movement on lockdown. The movement is most-readily seen in longer focal length lenses and these larger lenses are typically more usable under stronger tension than smaller ones. So, that issue mostly works itself out naturally. Because the chassis must contain the ball, the chassis must extend adequately over the max diameter of the ball. The ball stem coming against the chassis typically becomes the limiting factor for the clamp's max angle of tilt, a 45° angle for this head. While an L-plate-equipped camera or lens plate-equipped lens often does not need a significant amount of head tilt, a base-plate-only-equipped camera needs to be able to tilt a significant amount, especially to accommodate vertically oriented image capture. And, even cameras with L-plates sometimes need more range of motion for photographing up or down at strong angles. To accommodate these needs, most ball head bodies include a notch wide enough to permit the ball stem to drop down to a 90° angle, effectively handling any situation encountered. The position of the drop notch can be differentiating. Drop notches on the front of a head are optimal for shooting downward and the opposite is also true. The front-positioned drop notch is most common and shooting upward means that the ball lock knob is going to feel like it is on the wrong side of the head for most photographers. If not using an L-plate or lens-plate-equipped lens, visualize the camera and main knob positions when the camera is in vertical orientation to assess the design of a ball head. The Really Right Stuff BH-40 Ball Head has the notch in the front, most comfortably affording strong downward angle shooting. Most ball heads feature a panning base, allowing the head to be rotated independent of the ball adjustment position. Reasons for rotating the base include orienting the ball lock knob for comfortable use, for panorama capture and for simply moving the subject framing side-to-side. The panning base's brake feature is often a ball head design weakness, but not on this one. 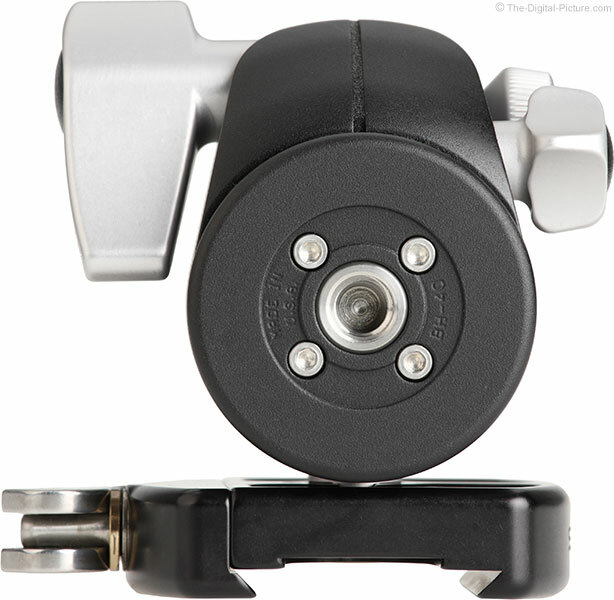 The Really Right Stuff BH-40 has a machined aluminum panning brake lock knob and the panning base rotates smoothly until locked tight, is evenly damped during a full rotation and it locks up tightly with only modest torque applied to the knob. While the shape of this knob is not round and is not meant to roll in the fingers, the 0.87" (22.1 mm) flared-square shape provides a sure grip that facilitates a very tight lockdown. 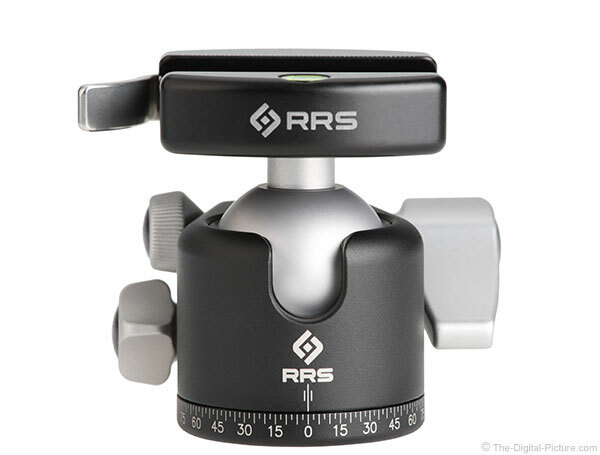 The Really Right Stuff BH-40 Ball Head's panning base measures 2.1" (53 mm). Another common feature on the panning base is an index. Indexed bases are most frequently used for precision panorama captures and this head has this feature with marks laser-engraved at 2.5 degree intervals. The Really Right Stuff BH-40 Ball Head's thread mount size is 3/8"-16, the (substantial) size most commonly offered by tripods. With the panning lock loosened, the BH-40 rotates very smoothly, but there is noticeable slip-stick action experienced when the lock is snugged. Ball heads minimally require threads on the ball stem and ideally have a quick release clamp for convenient camera mounting. The BH-40 clamps are compatible with the highly-desriable Arca-Swiss standard. Also of high importance is how the clamp's locking mechanism works. This head is available with a lever-release or screw-knob clamp. The screw-knob is a large CNC-machined aluminum design that works great. However, I fell in love with the Really Right Stuff Lever-Release Clamp long ago and have these clamps on most of my supports. That the BH-40 is available with the RRS lever-release makes clamp selection easy for me. Clamp size is somewhat of a differentiator. The larger the clamp is, the greater its potential gripping power becomes and the more rigid its construction can be. The BH-40 is available with full-sized clamps and a compact version of the lever-release clamp is available. I opted for the full-sized lever-release clamp for my BH-40, but those using smaller lenses might be as well-served with the still-substantial compact clamp (I have the compact lever-release clamp on my BH-30). Those looking for a weight savings will find the smaller clamp shaving off a minor 1.4 oz (41 g), 15.7 vs. 17.1 oz (445 vs 486 g). The compact clamp will less-readily impact the ball head body. Other RRS clamp features include an index and a spirit level (omitted on the compact lever-release clamp). While both of these options can be useful (such as when capturing precision panorama images using the nodal point), I mostly use the index to center my camera in the clamp and I use the electronic level in the camera for ideal leveling. The BH-40 clamp is end-user removable in case you change your mind or simply want to switch between the clamp types. RRS clamps are grooved to facilitate the use of safety stops on plates and brackets, helping to prevent gear from sliding out of a slightly-loosened clamp. The RRS lever-release clamps open to a position that permits gear adjustment without release and the safety stops are especially helpful in that position. There are a lot of camera and lens plate options and you will need one for the BH-40 (none is included). I recommend an L-plate for cameras and a lens plate for tripod-ring-equipped lenses. 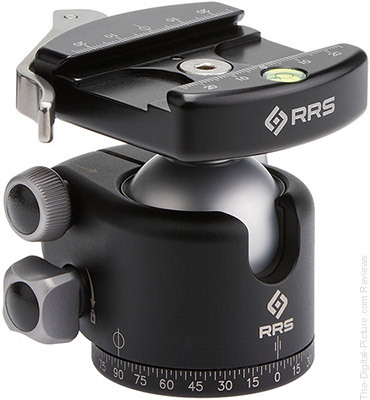 An additional RRS BH-40 clamp option is the panning clamp, offered in both lever-release and screw-knob variations. Ball head clamps can be leveled very quickly, especially with the aid of the spirit level or in-camera electronic level. 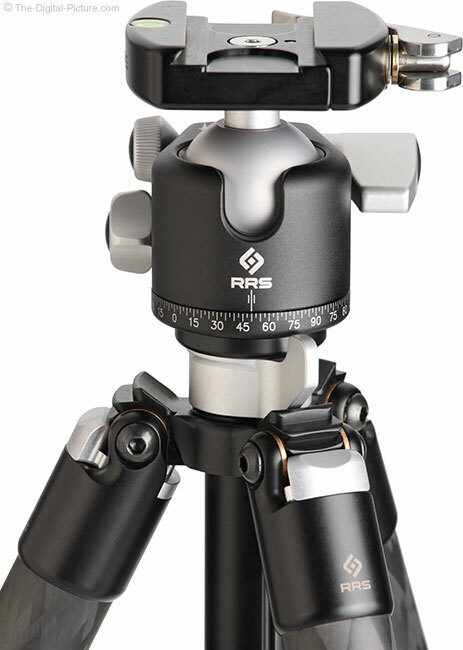 The panning base makes it easy to rotate the head, but the tripod must be perfectly level for the panning base to meet the precise needs of certain applications, such as panorama capture. 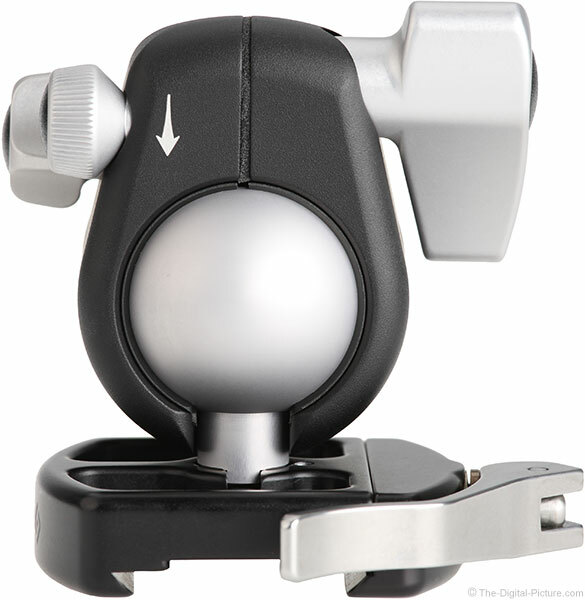 With a panning clamp, the ball can be used to quickly and easily level the head and the clamp itself can then be rotated above the ball for level camera movement. The downsides to this option are the additional cost (it is substantial) and the additional knob that will just be in the way if you are not using it. Getting both clamps resolves the latter issue. Just because a ball head works well at room temperature does not mean that it will work well in the cold. Ball head operation is sometimes negatively impacted by very cold temperatures, so ... the BH-40, along with its siblings, spent a cold night outside. The temperature had risen to 7° F (-14° C) by the time I brought them in the next morning and aside from the discomfort of the extremely cold head in my bare hands, they all worked flawlessly – similarly to when warm. While the panning brake knob and the tension knob are relatively close to each other, using this head with gloves is not a problem and the ball locking lever is especially easy to use with gloves on. Generally, ball head manufacturers provide load capacity specs for their heads and expect you to figure out what gear will play nicely together with their respective heads. While that can work, I'm generally not comfortable using weights approaching max load capacity with vibrations and load manageability being primary issues. To gain my comfort level, I used a Canon EOS 5Ds R mounted to a Canon EF 600mm f/4 L IS II for a 12.0 lb (5.4 kg) load and a Canon EF 100-400mm f/4.5-5.6L IS II lens combination that weighs 6.3 lb (2.9 kg). Before using the BH-40, my expectation was that the 600 would be overwhelming to this little ball head, but I was pleasantly surprised to find the load being easily managed and vibrations being quite low. The BH-40 held the 600 combination solidly at any angle I could put it in, including nearly seated in the drop notch. This is a very usable combination, especially if long exposures are not being used, though I still recommend getting the BH-55 if the 600mm lens is the primary lens being handled. If 600mm (or similar) support is needed infrequently, this head is up to the job. With that report, I'm sure that it is no surprise to hear that the BH-40 easily handled the 100-400. The 100-400 (similar in size and weight to 70-200mm f/2.8 lenses) felt better-proportioned for the size of this head and this head is an especially great option for lenses up to or modestly beyond a similar size. 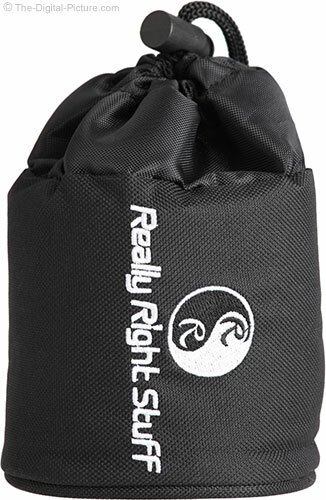 Really Right Stuff gear is purchased for its value and great performance (and great looks), not for the low price. Those who understand and appreciate the value of quality buy RRS products without hesitation. Really Right Stuff defines customer service excellence. It is very easy to reach an RRS representative via email, chat or phone and this company stands behind their products. RRS offers a limited 5-yr warranty on the BH-40 and I expect that this head will last a lifetime. A useful Padded Cordura pouch with drawstring closure is included in the box. I frequently use this cover for ball head protection when carrying the tripod uncased in the field and simply leave it on when casing the tripod. The reviewed Really Right Stuff BH-40 Ball Head was purchased online/retail. Two very good ball head options with BH-40-similar capabilities are the Acratech GP-s and the Gitzo GH1382QD. 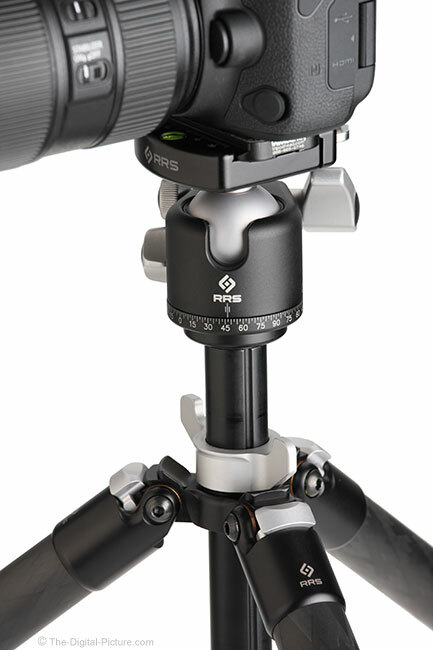 The Gitzo link goes straight to B&H as I've not had the time to create a review for this model yet, but it is very similar to the larger Gitzo GH3382QD Series 3 Center Ball Head that I have evaluated. Here is a comparison table with next-size-up and next-size-down RRS BH models included. The Acratech GP-s is another CNC-machined ball head model I currently own and use with some frequency. Thanks to its attractive skeletal design, it is also frequently featured in the site's lens product photos. The Acratech head is slightly lighter, a bit taller and tilts to a modestly-stronger angle. The Acratech has a rubberized rounded ball lock and panning brake knobs vs. the RRS's CNC-machined aluminum lever ball lock and flared-square panning brake knob. The Acratech has a higher load rating and it is slightly smoother in use, but I cannot lock the ball as tightly as with the RRS. Acratech GP-s vibrations take a bit longer to subside and it moves the ball considerably more than the RRS BH-40 when locking down. The Acratech is slightly less expensive, but the difference is not likely to be a differentiator for most. For those not certain that the BH-40 is enough head for them, the Really Right Stuff BH-55 Ball Head is a definite consideration. There seems to be enough size difference between the BH-40 and BH-55 heads to permit a BH-47.5 or similar option. In general, there are three reasons to go with a smaller tripod head. If the BH-40 is not small or light enough, the Really Right Stuff BH-30 Ball Head is another superb option. The Really Right Stuff BH-40 Ball Head is essentially a smaller version of the most-loved RRS BH-55, a head that, at review time, sits at #4 on the best-selling ball head list at B&H. The BH-40's position on that list? A near-equal 6th place out of 329 options. Not bad at all, especially considering the most expensive more popular non-RRS head is just over 1/4 the price of this one. People know the value of this head and the BH-40 is enjoying a very rapid inventory turnover rate. Especially when it comes to tripod-related gear, I'm very discerning in what becomes my daily use models. The RRS BH-40 is a superb ball head and this one found a permanent place in my kit. It will live on top of my RRS TVC-24/24L Tripod, at least until someone creates a better model. If you need a ball head (and you probably do), you will not likely find a better option than those offered by Really Right Stuff. If you need a highly capable ball head with a modest size and weight, there is no better choice than the BH-40.